PEUGEOT VIVACITY 50 & 100cc. 2000 to 20 10 (Vivacity 1 & 2). - great value Peugeot parts to your door! AMBER INDICATOR LENS'S TO FIT. 1 x REAR LEFT, AMBER LENS. 1 x REAR RIGHT, AMBER LENS. 1 x FRONT LEFT, AMBER LENS. Peugeot VIVACITY 50 100 (1st series). Peugeot VIVACITY 50 100 (2nd series). Peugeot indicator. NEW, original Peugeot. If a part does not match or there is another reason for complaint. Part Number. TO FIT ALL SPEEDFIGHT 2's FROM YEAR 2000 TO 2009. -PART-NUMBER 6853. (AS YOU SIT ON THE BIKE). INDICATOR COMPLETE AS SHOWN. REAR RIGHT. Peugeot Ludix, TKR, Trekker &Furious. Single indicator to fit. (as you sit on the bike). FRONT RIGHT or REAR LEFT. JUST £11.99. PART NUMBER 349830. UK MAINLAND. PEUGEOT VIVACITY 50 & 100cc. AMBER INDICATOR LENS'S FOR. 1 x FRONT LEFT, AMBER LENS. 1 x FRONT RIGHT, AMBER LENS. PEUGEOT VIVACITY 50 & 100cc. 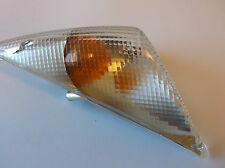 AMBER INDICATOR LENS'S FOR. 1 x REAR LEFT, AMBER LENS. 1 x REAR RIGHT, AMBER LENS. 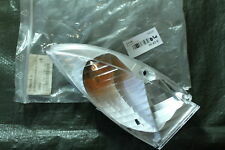 CLEAR INDICATOR LENS to fit PEUGEOT SPEEDFIGHT 2. - great value Peugeot parts to your door. (AS YOU SIT ON THE BIKE). 1 x FRONT RIGHT, CLEAR LENS. FRONT RIGHT. TO FIT ALL SPEEDFIGHT 2's FROM YEAR 2000 TO 2009. PART-NUMBER 6845. (AS YOU SIT ON THE BIKE). INDICATOR COMPLETE AS SHOWN. FRONT RIGHT. PEUGEOT SPEEDFIGHT 2. OFREAR CLEAR INDICATOR LENS'S. 1 x LEFT, 1 x RIGHT REAR CLEAR LENS. PARTWILL SUIT SPEEDFIGHT 2 50cc, MAYBE100cc MARKS 1 & 2. 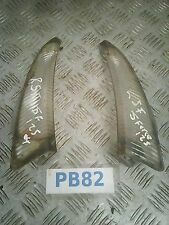 PAIR REAR INDICATORS FROM A PEUGEOT SPEED FIGHT 2 50cc. DIRTY, SCRATCHED FROM USE. THIS ITEM, CONSISTENT WITH BEING A USED SPARE PART, MAY HAVE SMALL MARKS TO FINISH & MINOR IMPERFECTIONS. CLEAR INDICAOR LENS FOR THE PEUGEOT SPEEDFIGHT 2. - great value Peugeot parts to your door! 1 x REAR LEFT, CLEAR LENS. Peugeot LUDIX 50 Blaster. Peugeot LUDIX 50 Blaster RS12. Peugeot TKR 2 50 Rally. Peugeot indicator. NEW, original Peugeot. Fit for front right and rear left. New and used parts. Part Number. Removed from an Peugeot Speedfight 2004 stripped for spares. Removed from a Peugeot Jetforce 125 2003 stripped for spares. They may need reset, reprogramming or require security codes, which we do not have. Ø Almost all of our cars which we are breaking are right hand drive cars. · Match yours part with ours part pictures. Removed from a Peugeot Speedfight 100 2003 stripped for spares. Removed from an Peugeot Speedfight 2001 stripped for spares. Removed from a Peugeot Blaster 50 2006 stripped for spares. PEUGEOT SUM-UP 125 2008. FRONT LEFT HAND SIDE INDICATOR. Ireland, Isle of Man, Isle of Wight, Jersey. This is a UK sale. Cash On Collection: No Problem! Removed from an Peugeot Speedfight 50 2002 stripped for spares. Removed from an Peugeot Speedfight 50 2001 stripped for spares. Removed from an Peugeot Ludix One 50 2006 stripped for spares. PEUGEOT ELEYSEO 125 DN - 2002. Genuine PEUGEOT part removed with care, cleaned & de-greased in good order - see photographs. See number 13 on the technical drawing photo to help with your selection. RIGHT REAR INDICATOR. Removed from an Peugeot Jetforce 50 2005 stripped for spares. Removed from a Peugeot Elyseo 125 2003 stripped for spares. A ny condition. Unwanted m otorcycles and scooters bought. Condition you can see at photo, look careful. Speedfight 2. INDICATOR FOR PEUGEOT. New Genuine Peugeot Spare Parts. Peugeot Part No. For best performance & reliability use Peugeot Genuine Spare Parts. Item : Indicator - LH / Front (Clear lens). Peugeot Elyseo 50. Peugeot 100 Elyseo. PEUGEOT ELYSEO 125 4T. Model: Elyseo 50. YAMAHA XJ 600 DIVERSION. PEUGEOT 50 / 100 / 125. PEUGEOT SV 50 / HERCULES SAMBA. Peugeot Elystar TSDI 50. Peugeot Part No. Item : Bulb, 12V 10W BA15S. BULB FOR PEUGEOT. New Genuine Peugeot Spare Parts. For best performance & reliability use Peugeot Genuine Spare Parts. PEUGEOT VIVACITY 3 50cc 2008. FOR OTHER GENUINE PEUGEOT PARTS. RIGHT FRONT INDICATOR ASSEMBLY. In dry storage ready to send out. See number 4 on the microfiche photo to help with your selection. Part No - PE737058. NOS Peugeot Indicator Unit - As Pictured. PEUGEOT SUM-UP 125. REAR FRONT INDICATOR. USED GOOD CONDITION. This is a UK sale. Cash On Collection: No Problem! PEUGEOT SUM-UP 125 2010. LEFT HAND SIDE FRONT. BROKEN ON FRONT EDGE. This is a UK sale. Cash On Collection: No Problem! If a part does not match or there is another reason for complaint. Large range of products at super prices. Specializing in models. Piaggio Ape. Storage location Therefore, each part by my hand is gone.